Now is the time to have your orders in to tree nurseries for bare root trees in the spring. We will be planting a significant number of trees around the property in 2016, but here is the list of trees pre-ordered for addition to our Phase 1 Food Forest. Hopefully these encourage you to get some trees ordered for your property this winter! We’ve got several additional apples, paw paws and stone fruits. We are also planting Antonovka root stock for future grafting. A detailed understanding of your lands contour is critical to sustainable use of water. We have been doing significant research lately on low-cost methods to obtain highly detailed contour maps of land. Below is a contour map generated last week of Six Hands Farm. It has 1 meter contour lines on top of an elevation gradient, which makes it easy to identify features of the property. More or less detail can be provided, including deep-zooms into specific areas of interest, based on requirements. (Click image to view larger size). The data used to generate this map is accurate to around 5cm, it varies in accuracy a bit more in areas of high foliage/tree cover where is is harder to determine the actual ground elevation. This data was captured via an aerial drone following an automated set of waypoints at 165ft altitude using a 12mp camera. The total capture time for ~55 acres was under 25 minutes. Lower altitudes can be used for higher accuracy. Processing of the data was done using a variety of commercial and open source tools, and takes about 24 hours. The low cost of these captures makes this data accessible to most land owners. In a consulting setting this capture could be done for less than $1000 with a two day turnaround. Today we pressure canned 20 pounds of freshly picked San Marzano tomatoes. These are wonderful tomatoes for canning as they peel easily and contain far less seeds than most other varietals. 20 pounds of tomatoes yielded 8 quart jars, with no added liquid. I process them in what I call ‘semi-crushed’ form. After peeling and slicing them I crush them lightly to release enough juice for the canning process, while still leaving many large chunks. They are the perfect consistency for using in soups, sauces or chili and will break down quickly when cooked. These are peeled by briefly blanching and moving to an ice bath, after which the peelings can be rubbed off quickly. They are brought to a boil for 5 minutes, and added to quart jars which contain 2 tablespoons of lemon juice, then put into the All American canner for 15 minutes at 10 pounds of pressure. You can look up the cooking time details here. You might be asking why acid must be added to canned tomatoes if you are using a pressure canner. The answer is simple – You can cook them without adding acid if you want to do a standard low-acid vegetable canning cook time of 40 minutes. This long cook time would destroy the texture and nutrient value of your tomatoes though, which is why most recipes you’ll see choose to compromise a shorter cook time with the addition of acid. Early this morning the latest addition to the farm arrived. 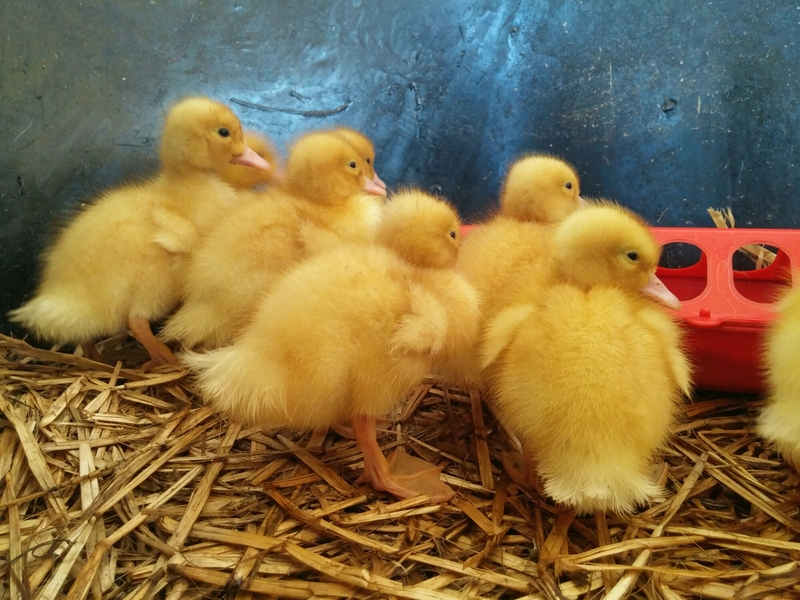 Thirteen white layer ducks from Metzer farms. These are a version of the Metzer 300 Hybrid, and are prolific egg layers. The little girls were placed into their brooder where they’ll stay for the next couple weeks. They are eating a wonderful corn free, GMO free, soy free, organic feed manufactured locally. We’ll keep getting pictures and videos out as we complete construction on their home and migrate them outside. 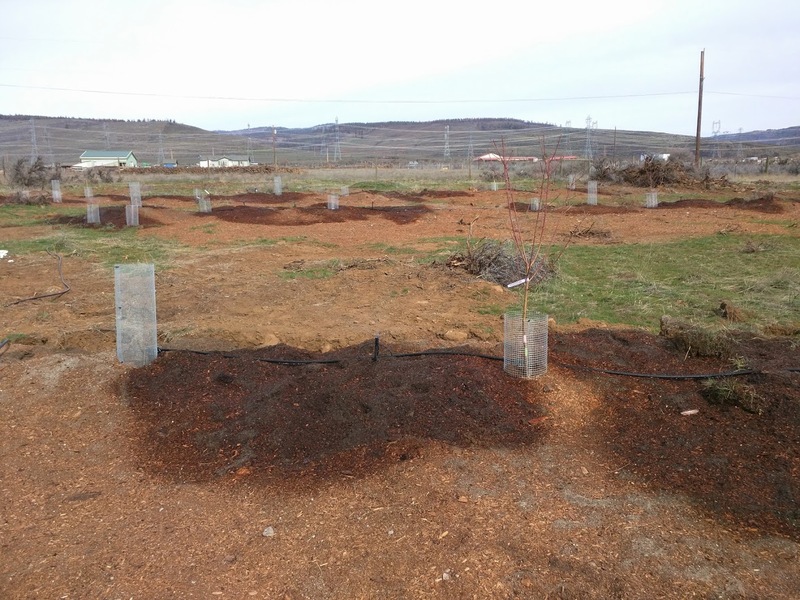 So you are starting a one acre food forest on a semi-arid zone 6 property. What do you plant? Well, lets go through the items we decided to plant, working our way from the canopy to the soil surface. Planted as seedlings. True American Chestnuts from blight-free stands in Washington. All planted as as bare root trees on Antanovka root stock. Bare root trees on Lovell root stock. Bare root on Gisela root stock. Bare root on Marianna root stock. Significant numbers planted from rooted cuttings to help with early establishment. Already growing very well. Sourced inexpensively on Ebay. Hardy evergreen shrub with tart edible berries. Historically native to the area. 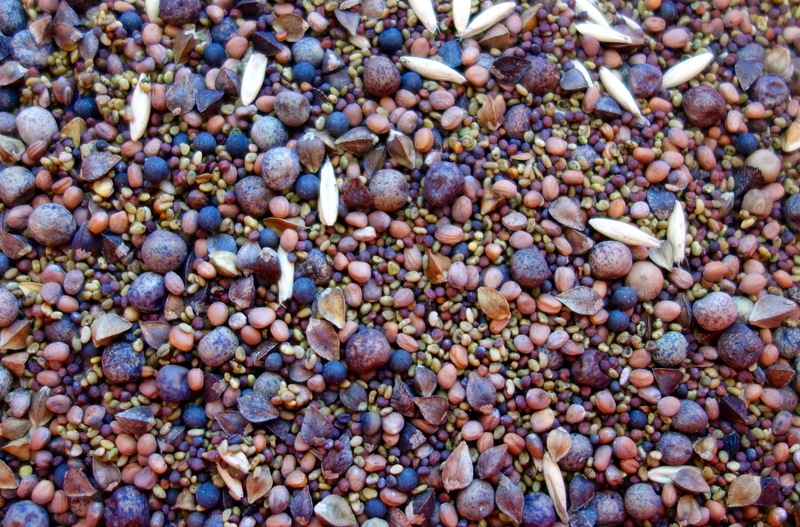 Compact high-producing commercial variety from Scotland. Another Scottish variety which is later blooming. We don’t expect much success with the blueberries until the the forest is more established due to soil acidity issues, but we’ve planted quite a few and we’ll see how they do. Most trees were planted inside tubes of hardware cloth fastened with zip ties. The hardware cloth tubes go several inches into the ground to help reduce vole, deer and rabbit damage. It is a significant amount of work to create all of the hardware cloth tubes, so inexpensive and abundant rooted cuttings were left unprotected. You can also see here the 3/4inch drip irrigation tubes run along each swale. 5gph drip fittings are attached near trees, and misters are placed periodically to help with growth of herbaceous plants on the swale. Abundant wildlife is one of the great aspects of living in the country. 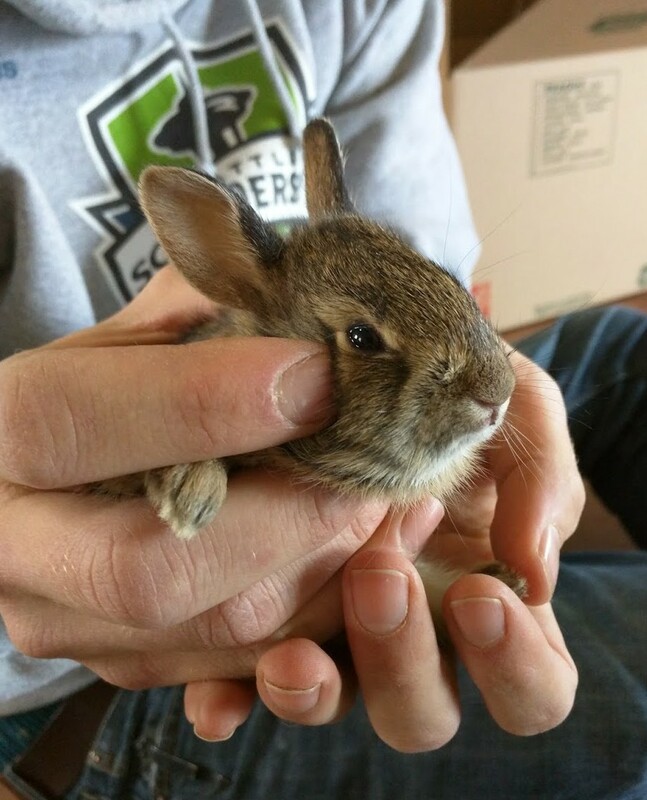 Today we discovered some baby rabbits (Mountain Cottontail’s) had made a home in the workshop. The clovers and Alfalfa were innoculated, and everything was mixed together in 5-gallon buckets. It was then broadcast around the entire food forest area, as well as other areas on the property.